Scientists from The Danish Stem Cell Center (DanStem) at the University of Copenhagen and Hagedorn Research Institute have gained new insight into the signaling paths that control the body’s insulin production. This is important knowledge with respect to their final goal: the conversion of stem cells into insulin-producing beta cells that can be implanted into patients who need them. The research results have just been published in the well-respected journal PNAS. The new research results were obtained in a cooperative effort between DanStem, the Danish Hagedorn Research Institute and international partners in Japan, Germany, Korea and the USA. of the colony. Credit: Joshua Brickmann, DanStem. Insulin is a hormone produced by beta cells in the pancreas. If these beta cells are defective, the body develops diabetes. Insulin is vital to life and therefore today the people who cannot produce their own in sufficient quantities, or at all, receive carefully measured doses – often via several daily injections. Scientists hope that in the not-so-distant future it will be possible to treat diabetes more effectively and prevent secondary diseases such as cardiac disease, blindness and nerve and kidney complications by offering diabetes patients implants of new, well-functioning, stem-cell-based beta cells. “In order to get stem cells to develop into insulin-producing beta cells, it is necessary to know what signaling mechanisms normally control the creation of beta cells during fetal development. This is what our new research results can contribute,” explains Professor Palle Serup from DanStem. “When we know the signaling paths, we can copy them in test tubes and thus in time convert stem cells to beta cells,” says Professor Serup. The signaling mechanism that controls the first steps of the development from stem cells to beta cells has long been known. This new knowledge about the characteristics of the Notch signaling mechanism will enable scientists to design new experimental ways to cultivate stem cells so that they can be more effectively converted into insulin-producing beta cells. The Danish Stem Cell Center opened in the Summer 2011 as a hub for international basic, translational and early clinical stem cell research. Professor Serup and his group joined DanStem in January 2012 to partake in the build-up the center together with three other, internationally renowned research groups recruited from Sweden, Switzerland and Scotland. DanStem address basic questions in stem cell and developmental biology, and develop novel stem cell based therapeutic approaches for diabetes and cancer. It is supported by two major grants from Novo Nordisk Foundation (DKK 350 million (€ 47 million)) and the Danish Research Council for Strategic Research (DKK 64.8 million (€ 8,7 million)), respectively. Hagedorn Research Institute (HRI) is part of Novo Nordisk A/S. The Institute’s work is directed at developing better treatment for people with diabetes – both through basic research and research aimed at early application. HRI was established as an independent entity in 1978 and today is an internationally recognized and prize-winning research unit. The University of Michigan's second human embryonic stem cell line has just been placed on the U.S. National Institutes of Health's registry, making the cells available for federally-funded research. It is the second of the stem cell lines derived at U-M to be placed on the registry. from a donated embryo. Credit: U-M. The line, known as UM11-1PGD, was derived from a cluster of about 30 cells removed from a donated five-day-old embryo roughly the size of the period at the end of this sentence. That embryo was created for reproductive purposes, tested and found to be affected with a genetic disorder, deemed not suitable for implantation, and would therefore have otherwise been discarded when it was donated in 2011. It carries the gene defect responsible for Charcot-Marie-Tooth disease, a hereditary neurological disorder characterized by a slowly progressive degeneration of the muscles in the foot, lower leg and hand. CMT, as it is known, is one of the most common inherited neurological disorders, affecting one in 2,500 people in the United States. People with CMT usually begin to experience symptoms in adolescence or early adulthood. The embryo used to create the cell line was never frozen, but rather was transported from another IVF laboratory in the state of Michigan to the U-M in a special container. This may mean that these stem cells will have unique characteristics and utilities in understanding CMT disease progression or screening therapies in comparison to other human embryonic stem cells. "We are proud to provide this cell line to the scientific community, in hopes that it may aid the search for new treatments and even a cure for CMT," says Gary Smith, Ph.D., who derived the line and also is co-director of the U-M Consortium for Stem Cell Therapies, part of the A. Alfred Taubman Medical Research Institute. "Once again, the acceptance of these cells to the registry demonstrates our attention to details of proper oversight, consenting, and following of NIH guidelines." U-M is one of only four institutions – including two other universities and one private company – to have disease-specific stem cell lines listed in the national registry. U-M has several other disease-specific hESC lines submitted to NIH and awaiting approval, says Smith, who is a professor in the Department of Obstetrics and Gynecology at the University of Michigan Medical School. The first line, a genetically normal one, was accepted to the registry in February. "Stem cell lines that carry genetic traits linked to specific diseases are a model system to investigate what causes these diseases and come up with treatments," says Sue O'Shea, Ph.D., professor of Cell and Developmental Biology at the U-M Medical School, and co-director of the Consortium for Stem Cell Therapies. Each line is the culmination of years of preparation and cooperation between U-M and Genesis Genetics, a Michigan-based genetic diagnostic company. This work was made possible by Michigan voters' November 2008 approval of a state constitutional amendment permitting scientists to derive embryonic stem cell lines using surplus embryos from fertility clinics or embryos with genetic abnormalities and not suitable for implantation. The amendment also made possible an unusual collaboration that has blossomed between the University of Michigan and molecular research scientists at Genesis Genetics, a company that has grown in only eight years to become the leading global provider of pre-implantation genetic diagnosis (PGD) testing. PGD is a testing method used to identify days-old embryos carrying the genetic mutations responsible for serious inherited diseases. During a PGD test, a single cell is removed from an eight-celled embryo. 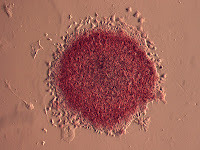 The other seven cells continue to multiply and on the fifth day form a cluster of roughly 100 cells known as a blastocyst. The agreement was worked out between U-M's Smith and Mark Hughes, M.D., Ph.D., founder and president of Genesis Genetics and a pioneer in the field of pre-implantation genetic diagnosis. "These are very precious cells, and it would be unconscionable not to take advantage of such an opportunity for medical science and the cure of disease," Hughes says. "This is another major step forward for medical science in Michigan. It opens up another avenue for researchers to really begin exploring the causes and progression of those diseases, with the ultimate goal of finding new therapies for patients," says Eva Feldman, M.D., Ph.D., F.A.A.N., director of the A. Alfred Taubman Medical Research Institute and the Russell N. DeJong professor of neurology at the U-M Medical School. Feldman sees patients with CMT as part of her clinical practice. Contributors to the A. Alfred Taubman Medical Research Institute's Consortium for Stem Cell Therapies include the Taubman Institute; the Office of the Executive Vice President for Medical Affairs; the Office of the Medical School Dean; the Comprehensive Cancer Center; the Department of Pediatrics and Communicable Diseases; the Office of the Vice President for Research; the School of Dentistry; the Department of Pathology; the Department of Cell and Developmental Biology; the College of Engineering; the Life Sciences Institute; the Department of Neurology; and U-M's Michigan Institute for Clinical and Health Research. A. Alfred Taubman, founder and chair of U-M's Taubman Institute, called the second registry placement a tremendous step for stem cell research. "I consider stem cells to be a modern medical miracle – the most exciting advance in medicine since antibiotics. The progress we have made throughout the state in stem cell research has been nothing short of remarkable," he says. "This new milestone means much to the University and the state of Michigan, but also to the world. It offers another route for researchers to move ahead in studying these horrible diseases. We hope it is the first of many lines that we can contribute to the global efforts to improve human health." 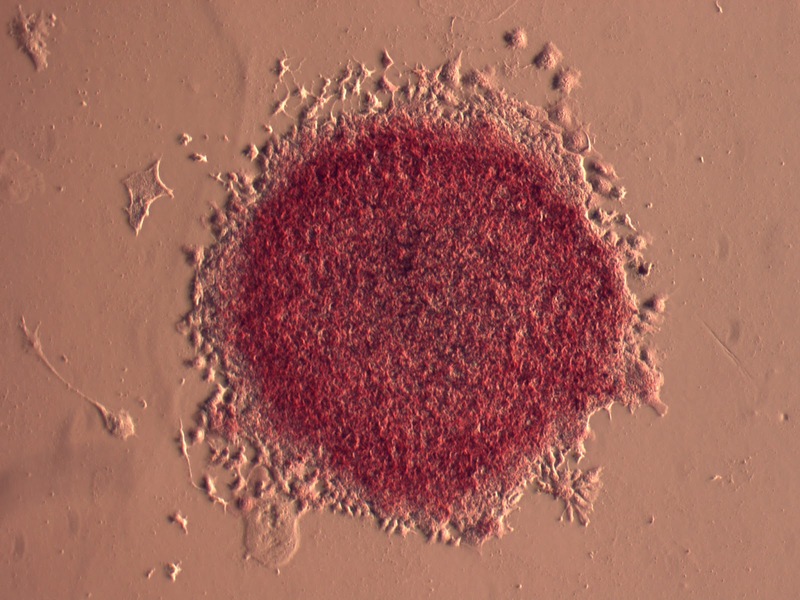 Researchers at Lund University in Sweden have discovered a new stem cell in the adult brain. These cells can proliferate and form several different cell types - most importantly, they can form new brain cells. Scientists hope to take advantage of the finding to develop methods to heal and repair disease and injury in the brain. Analyzing brain tissue from biopsies, the researchers for the first time found stem cells located around small blood vessels in the brain. The cell's specific function is still unclear, but its plastic properties suggest great potential. "A similar cell type has been identified in several other organs where it can promote regeneration of muscle, bone, cartilage and adipose tissue," said Patrik Brundin, M.D., Ph.D., Jay Van Andel Endowed Chair in Parkinson's Research at Van Andel Research Institute (VARI), Head of the Neuronal Survival Unit at Lund University and senior author of the study. "Our findings show that the cell capacity is much larger than we originally thought, and that these cells are very versatile," said Gesine Paul-Visse, Ph.D., Associate Professor of Neuroscience at Lund University and the study's primary author. "Most interesting is their ability to form neuronal cells, but they can also be developed for other cell types. The results contribute to better understanding of how brain cell plasticity works and opens up new opportunities to exploit these very features." "We hope that our findings may lead to a new and better understanding of the brain's own repair mechanisms," said Dr. Paul-Visse. "Ultimately the goal is to strengthen these mechanisms and develop new treatments that can repair the diseased brain." The research at Neuronal Survival Unit, Lund University, Sweden is focused on pathogenetic mechanisms and pharmacological treatment in cell and animal models of Parkinson's and Alzheimer's diseases. We also study cell replacement therapy with stem cells in attempts to repair brains in animal models of Parkinson's diseases. The group's mission is to understand neurodegenerative diseases and develop new therapies that are of benefit to patients and their caregivers. A new study presented today at the International Liver Congress™ 2012 indicates the potential for gallbladder tissue (which is routinely discarded from organ donors and surgical interventions) to be a highly available candidate source for multipotential stem cells. Biliary tree stem/progenitor cells (BTSCs) have previously been identified in the glands of normal adult human extrahepatic bile ducts and been shown to generate in vitro and in vivo mature cells of the hepato-biliary and pancreatic endocrine lineages. The study found both normal and pathological gallbladders contained easily isolable cells with the phenotype and biological properties of BTSCs. Interestingly, in an animal model, these cells were able to repopulate the injured liver and to improve synthetic functions. These data open novel perspectives for the collection and use of multipotent stem cells in regenerative therapies of liver, bile duct, and pancreatic diseases including diabetes. Combined, complimentary therapies have the ability to maximize the benefits of neural stem cell (NSC) transplantation for spinal cord repair in rat models, according to a study carried out by a team of Korean researchers who published in a recent issue of Cell Transplantation (20:9). "When transplanted, neural stem cells have demonstrated their therapeutic potential to reverse complex pathological processes following spinal cord injury," said study corresponding author Dr. Byung G. Kim of the Ajou University School of Medicine's Brain Disease Research Center and Department of Neurology, Republic of Korea. "However, many obstacles cannot be overcome by NSC transplant alone." Their study demonstrated that a combination of treatment strategies - a polymer scaffold, neurotrophin-3 (NT3) and chondroitinase (an enzyme which helps digest the glial scar that formed after a spinal cord injury) - provided added therapeutic benefits to NSC transplantation. The implantation of a polymer scaffold designed to bridge lesion cavities, created a favourable tissue environment for nerve growth. Incorporating the NT3 gene into the transplanted cells improved cell survival and migration while the addition of chondroitinase positively affected neural activity between the scaffold and the spinal cord. "The poly (ε-caprolactone) [PCL] scaffold in our study appeared to function like a reservoir supplying migratory NSCs to the spinal cord," said Dr. Kim. "The NSCs grafted with the scaffolds survived the transplantation and migrated to the host spinal cord." The study included four animal groups, only one of which received the full combination of therapies. Rats in the full combination therapy group were found to have some restored neuroplasticity and enhanced re-myelination of contralateral white matter. All four groups subsequently underwent functional testing for locomotor recovery. "Rats in the full combination group attained well-coordinated plantar stepping accompanied by improved ankle positioning and toe clearance and reduced paw placement errors," explained Dr. Kim. "Furthermore, animals with the full complement of combination strategies responded to transcranial magnetic stimulation." "We believe that our results have important clinical implications regarding the future design of NSC-based therapeutic strategies for human victims of traumatic spinal cord injury," concluded Dr. Kim and co-authors. "The use of multiple strategies to treat spinal cord injury could prove to be more effective than any single treatment," said Cell Transplantation section editor Dr. John Sladek, professor of neurology and paediatrics at the University of Colorado School of Medicine. "Changing the hostile environment post spinal cord injury by the use of scaffolds, neurotrophins and breakdown of the glial scar creates a favourable milieu for NSCs to be able to exert benefit". Hwang, D. H.; Kim, H. M.; Kang, Y. M.; Joo, I. S.; Cho, C. S.; Yoon, B. W.; Kim, S. U.; Kim, B. G.
What happens to a stem cell at the molecular level that causes it to become one type of cell rather than another? At what point is it committed to that cell fate, and how does it become committed? The answers to these questions have been largely unknown. But now, in studies that mark a major step forward in our understanding of stem cells' fates, a team of researchers from the California Institute of Technology (Caltech) has traced the stepwise developmental process that ensures certain stem cells will become T cells — cells of the immune system that help destroy invading pathogens. "This is the first time that a natural developmental process has been dissected in such detail, going from step to step to step, looking at activities of all the genes in the genome," says Ellen Rothenberg, the principal investigator on the study and the Albert Billings Ruddock Professor of Biology at Caltech. "It means that in genetic terms, there is virtually nothing left hidden in this system." The study was led by Jingli A. Zhang, a graduate student in Rothenberg's lab, who is now a postdoctoral scholar at Caltech. The group's findings appear in the April 13 issue of the journal Cell. The researchers studied multipotent hematopoietic precursor cells — stem-cell-like cells that express a wide variety of genes and have the capability to differentiate into a number of different blood-cell types, including those of the immune system. 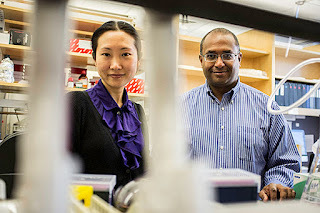 Taking into consideration the entire mouse genome, the researchers pinpointed all the genes that play a role in transforming such precursor cells into committed T cells and identified when in the developmental process they each turn on. 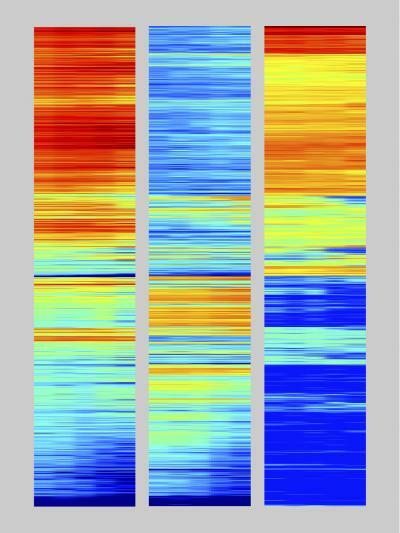 At the same time, the researchers tracked genes that could guide the precursor cells to various alternative pathways. The results showed not only when but also how the T-cell-development process turned off the genes promoting alternative fates. "We were able to ask, 'Do T-cell genes turn on before the genes that promote some specific alternative to T cells turn off, or does it go in the other order? Which genes turn on first? Which genes turn off first?'" Rothenberg explains. "In most genome-wide studies, you rarely have the ability to see what comes first, second, third, and so on, in a developmental progression. And establishing those before-after relationships is absolutely critical if you want to understand such a complicated process." The researchers studied five stages in the cascade of molecular events that yields a T cell — two before commitment, a commitment stage, and then two following commitment. They identified the genes that are expressed throughout those stages, including many that code for regulatory proteins, called transcription factors, which turn particular genes on or off. They found that a major regulatory shift occurs between the second and third stages, when T-cell commitment sets in. At that point, a large number of the transcription factors that activate genes associated with uncommitted stem cells turn off, while others that activate genes needed for future steps in T-cell development turn on. The researchers looked not only at which genes are expressed during the various stages but also at what makes it possible for those genes to be expressed at that particular time. One critical component of regulation is the expression of transcription-factor genes themselves. Beyond that, the researchers were interested in identifying control sequences — the parts of genes that serve as docking sites for transcription factors. These sequences are often very difficult to identify in mice and humans using classical molecular-biology techniques; scientists have spent as many as 10 years trying to create a comprehensive map of the control sequences for a single gene. To create a map of likely control sequences, Zhang studied epigenetic markers. These are chemical modifications, such as those that change the way the DNA is bundled. They become associated with particular regions of DNA as a result of the action of transcription factors and can thereby affect how easy or hard it is for a neighboring gene to be turned on or off. By identifying DNA regions where epigenetic markers are added or removed, Rothenberg's group has paved the way for researchers to identify control sequences for many of the genes that turn on or off during T-cell development. In some ways, Rothenberg says, her team is taking a backward approach to the problem of locating these control sequences. "What we're saying is, if we can tell that a gene is turned on at a certain point in terms of producing RNA, then we should also be able to look at the DNA sequences right around it and ask, 'Is there any stretch of DNA sequence that adds or loses epigenetic markers at the same time?'" Rothenberg says. "If we find it, that can be a really hot candidate for the control sequences that were used to turn that gene on." Two methodologies have made it possible to complete this work. First, ultra-high-throughput DNA sequencing was used to identify when major changes in gene expression occur along the developmental pathway. This technique amplifies DNA sequences taken throughout millions of cell samples, puts all of the bits in order, compares them to the known genome sequence (for mice, in this case), and identifies which of the various genes are enriched, or found in greater numbers. Those that are enriched are the ones most likely to be expressed. 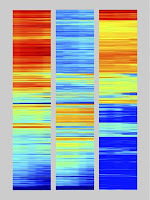 The team also used a modified version of this sequencing technique to identify the parts of the genome that are associated with particular epigenetic markers. Coauthor Barbara Wold, Caltech's Bren Professor of Molecular Biology, is an expert in these so-called "next-generation" deep-sequencing technologies and provided critical inspiration for the study. A second important methodology involved an in vitro tissue-culture system developed in the lab of Juan Carlos Zúñiga-Pflücker of the University of Toronto, which enabled the Caltech researchers to mass-produce synchronized early T-cell precursors and to see the effect of altered conditions on individual cells in terms of producing T cells or other cells. The brave new world of stem cell research dangles the exciting potential for a host of leading-edge treatments that may one day help cure debilitating diseases such as Alzheimer's and Parkinson's, maladies that today cannot be treated with modern medicine. However, not much thought has been given to how those products might be regulated and how issues of legal liability may be addressed in a way that encourages scientific innovation but also protects the patients for whom these treatments might provide great relief. Now, a lawyer from the UCLA School of Law and a member of the Eli and Edythe Broad Center of Regenerative Medicine and Stem Cell Research at UCLA has developed a road map that could help guide researchers, stem cell product manufacturers, treating physicians and patients through the complex maze of imagining, creating and developing stem cell products and using them to treat disease. "Stem cell research and its eventual applications hold enormous promise, but they also carry some significant risks," said Stephen R. Munzer, a distinguished professor of law and author of the article. "Our understanding of the number and gravity of those risks right now is incomplete and uncertain. Developing a plan now that details how to deal with such issues as stem cell product liability is important, because we need to think carefully and rationally about how to address these issues before the market is flooded with products." Munzer's work appears April 11, 2012 in the Boston University Journal of Science and Technology Law. In the article, Munzer offers suggestions on how stem cell products might be classified in the future, examines how applying existing product liability rules to stem cell products is inadequate, details the economic considerations for a stem cell liability regime and offers his views of what the law should be on liability for stem cells. "One thing I detect from the stem cell scientists I've spoken to is a certain amount of judicious caution," he said. "What they don't want is to have people rushing to get something approved by the FDA and then see it result in unanticipated, unforeseeable problems." One of the byproducts of that judicious caution, both of risk of liability and potential risk to patients, Munzer said, has been scientists and biotech companies initially going after the so-called "low hanging fruit" of stem cell treatments, those projects that appear to have the least amount of risk and maximum benefit, such as treatments for retinal disease as opposed to organ regeneration. In the article, Munzer also emphasizes the "ethics of risk," or having all those involved from the conception of an idea for a stem cell product to its eventual development and manufacture and administration, accountable for the risks they may be imposing on patients. "The scientists who come up with the ideas for these products, the people who design them, the biotech companies that manufacture them and produce them in large numbers and the treating physicians who ultimately will be administering these treatments all have to be accountable, as well as the FDA, which is charged with regulating them," Munzer said. Munzer likened the anticipation for potential stem cell products to the excitement created in the 1980s and 1990s over early gene therapies and what may have been a rush to test the therapies without adequately considering the risks. That potential for new treatments was temporarily derailed after an 18-year-old, Jesse Gelsinger, in a gene therapy trial died in 1999 as a result of the treatment. "Existing blood products, growth factors, vaccines, we've got more understanding of how those things work and that is not true in the case of stem cells," Munzer said. "We want to create a strict liability regime that encourages innovation, but on the other hand does not encourage it so much that products are put on the market long before they should be." Munzer suggests creating a social-insurance arrangement that would pool resources from everyone involved from the scientists to the manufacturers to the treating physician and the patients, contributing to a fund that could eventually be used to compensate those harmed by stem cell products during their testing. His proposal is similar to the National Vaccine Injury Compensation Program, a no fault alternative to the traditional tort system created in 1988 to ensure an adequate supply of vaccines, stabilize vaccine costs and establish and maintain an accessible and efficient forum for individuals found to be injured by certain vaccines. Munzer also recommends limiting punitive damages in stem cells cases, but only if the product has been FDA approved and the FDA regulatory requirements have been strictly followed, the risks of the products have become more understood and predictable, and the FDA has gained sufficient experience in regulating the products. Munzer's liability road map could be of value to courts, lawyers and regulatory bodies in navigating what is to come in stem cell product development. It also should be considered a dynamic document, he said, that responds to what is learned in the coming decades about the creation and development of stem cell products. "It is important to address these issues this early with as much insight as we can bring to it, recognizing that there will be, as the years go on, more information and a better understanding of what we're doing," he said. "Starting to address this now instead of waiting five to 10 years is vital, as it will be much easier to prevent potential mishaps and messes from occurring than it will be to try to clean them up later." Munzer's article attempts to tackle problems that are on or just beyond the horizon, and looks to what has happened in the past for guidance. "The product liability claims regarding stem cell products will require the most exacting attention to their safety and effectiveness that is possible without imposing an undue burden on manufacturers," the study states. "No existing category offers a perfect legal model for stem cell products. However, we can tease out pertinent features of these categories for tort litigation to show what might work well for stem cell products. Definitive recommendations must wait for these products to appear on the market and for their risks and rewards to become better understood over the coming decades." Mou credits learning the underlying developmental biology in mice as the key to making tremendous progress in only two years. "I was able to apply these lessons to the iPS cell systems," she said. "I was pleasantly surprised the research went so fast, and it makes me excited to think important things are within reach. It opens up the door to identifying new small molecules [drugs] to treat lung disease." "This work makes it possible to produce millions of cells for drug screening, and for the first time human patients' cells can be used as the target." "I would expect to see rapid progress in this area now that human cells, the very cells that are defective in the disease, can be used for screening." "The key to our success was the ecosystem of the Harvard Stem Cell Institute and MGH. HSCI investigators pioneered the strategies we used, helped us at the bench, and gave us advice on how to combine our knowledge of lung development with their exciting new platforms. 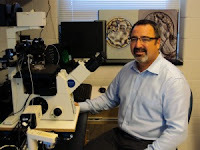 Indeed, we also enjoyed a wonderful collaboration with Darrell Kotton's lab at Boston University that was able to convert mouse cells into lung tissue. These interactions really helped fuel us ahead." Rajagopal said. "When we talk about research and advances, donors and patients ask: 'When? How soon?' And we usually hesitate to answer. But we now have every single piece we need for the final push. So I have every hope that we'll have a therapy in a matter of years." Genuine human airway tissue is the gold standard prior to drugs being tested clinically, but it has been extremely difficult to obtain the tissue from patients, and when it could be obtained, the tissue rarely survived long in the lab – all of which created a major bottleneck in screening for a therapy. But by creating iPS cells that contain the entire genome of a CF patient and directing those cells to develop into lung progenitor cells, which then develop into epithelium, the group appears to have solved this key problem. "We've created the perfect cell line to show that the drug out there that works against G551D mutation works in this system, and then we're in business to screen for a drug against delta 508," he said. "We'll know soon that the cell line works. We know it makes bonafide airway epithelium, and we'll have the proof of principle that the tissue responds properly to the only known drug. We think this is the near-ideal tissue platform to find a drug for the majority of CF."